Like Christmas, it is both about giving AND receiving. Whether or not you agree that Christmas is the #1 holiday, we can all agree that it is definitely in the big league of holidays. It has the songs, the traditions, the Starbucks promotions, and a solid two-month shopping season. Christmas is a big deal and the one thing that everyone goes out of their way to say during Christmas is that Christmas is about giving. But the one thing that any 2nd grader will tell you is, “Yeah, but actually getting presents is pretty great.” So everyone ignores the cognitive dissonance by enjoying both giving and receiving on Christmas. But guess what?!? 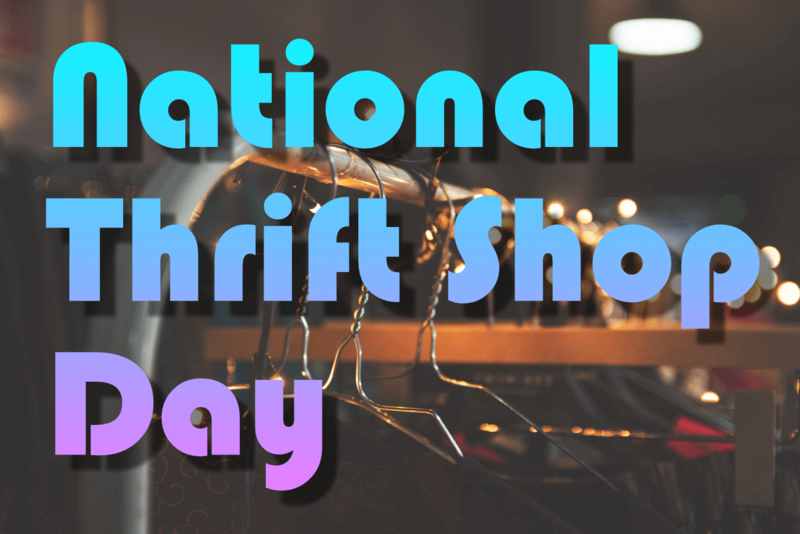 National Thrift Shop Day is all about giving and receiving too! Thrift shops run on donations. If you’ve ever gone to a lesser thrift store (not ThriftSmart), you may have thought, “I can’t really find anything good in here.” That’s because no one donated anything good. Fortunately, ThriftSmart is part of a great community of amazing people who have given some amazing items. Because of this giving, we are able to provide quality goods at incredibly affordable prices. 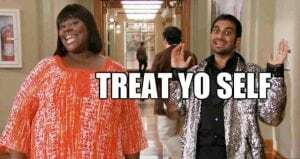 But all those great things at great prices mean that National Thrift Shop Day is basically a real version of Treat Yo’ Self Day. Go ahead and splurge without breaking the budget! It is Black Friday in August! Columbus Day has really taken a hit lately. Not only was Columbus kind of an invading foreigner, but he wasn’t even the first European to make it here. But National Thrift Shop Day is still in its infancy as a holiday. Yes, it is popular and great now, but it has nowhere to go but up! Columbus Day may not be politically correct anymore, but recycling and responsibly-sourced clothing certainly are. And you know who has an entire ethos and mission statement built on that? ThirftSmart does. Welcome to the future. Thrift stores are affordable even on an off day. But August 17th is definitely an “on” day. Everything at ThriftSmart is 50% off. What other holiday guarantees a deal? Not even Black Friday has everything half off at most retailers. The only thing that even comes close is buying Halloween candy a week after Halloween. It can be a good eating holiday if you want it to be. Technically National Thrift Shop Day isn’t an eating holiday like Thanksgiving. But really, anything can be an eating holiday if you try hard enough. You can even put on a National Thrift Shop Day feast to remember with a nearly-new dining set or cookware. And ThriftSmart happens to be located near one of Nashville’s best dining destinations with great restaurants from around the world! It is the most fashionable holiday. Easter means church clothes, Derby Day means hats, and Christmas means ugly sweaters. But you can have it all on National Thrift Shop Day! Go retro, or go professional. Repurpose something, or wear it right off the rack! No matter what you’re looking for, find it for a better price on August 17th. It’s like a National Thrift Shop Day miracle! It is way more open than exclusive holidays like Valentine’s Day or Mother’s Day. Believe it or not, but not every holiday is a warm family-friendly holiday. Valentine’s Day is really just for people who are already happily romantically involved (or legally obligated to be). All those lonely hearts out there are left in the cold. And Mother’s Day has its exclusivity right there in the title! How are non mothers supposed to get excited about that? National Thrift Shop Day is about togetherness; whether it is with friends or families, gather up your loved ones for a good ol’ fashioned National Thrift Shop Day! Or maybe that’s not your thing. Maybe you just want to be left alone and in peace. National Thrift Shop Day is fine with that, too. As we’ve already mentioned, National Thrift Shop Day has many of the most endearing elements of other holidays. The social consciousness of Earth Day. We could even argue that National Thrift Shop Day is a better Earth Day than Earth Day actually is. Let’s see Labor Day try and top all that! So join ThriftSmart as we celebrate one of the best holidays of the year. Maybe even the 5th best if we’re being really honest. Despite the holiday, ThriftSmart will be open at the usual hours August 17th.